Simplification and rationalization of processing of AEO-T1 application – Reg. Designagnation of Appellate Authority and CPIO – Reg. Electronic sealing – Deposit in and removal of goods from Customs Bonded Warehouses – Reg. Transport of Containers by train from Visakhapatnam Port to Birgunj under Transhipment Procedure-Electronic Cargo Tracking System (ECTS) on pilot basis – Reg. Postponment of implementation of Sea Cargo Manifest and Transhipment Regulations, 2018 – Reg. Guidelines for clearance of factory stuffed containers and e-sealed by the exporter themselves at Visakhapatnam Port - Reg. Refund/Claim of Countervailing duty as Duty Drawback. Drawing of samples for the purpose of grant of drawback – reg. Permission to operate customs Bonded Trucks Facility from Visakhapatnam through Gateway Airports by M/s Shreeji Translogistics limited, Bangalore– Reg. 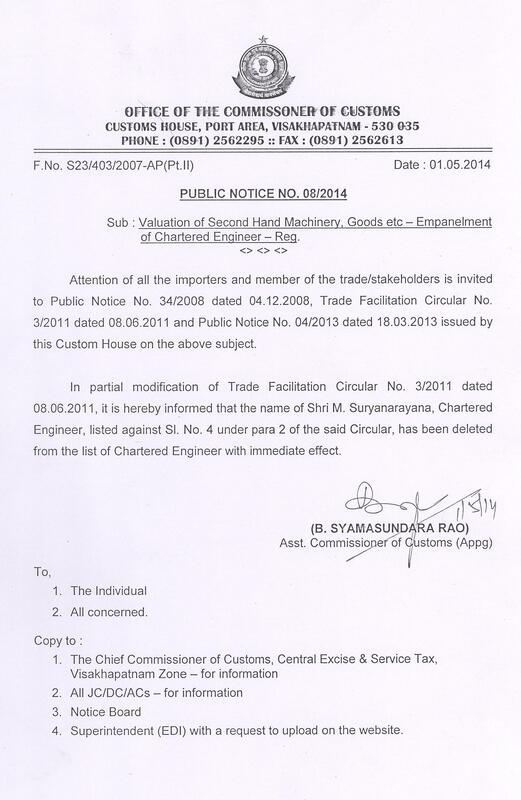 Examination / Inspection of goods under Import without Delivery Order-reg. Validation of Bank Accounts in the Public Financial Management System(PFMS) for speedy & smooth disbursal of IGST(Integrated Goods & Services Tax) Export Refund-reg. Declaration of M/s. AP Trade Promotion Corporation Ltd" as Customs Area under section 8(b) of the Customs Act, 1962-reg. International Transhipment of Containers to and from Foreign Ports through Visakhapatnam Port-reg. Implementing electronic sealing for containers by Exporters under self-sealing procedure prescribed by Circular 26/2017-Cus dated 01st july, 2017 and Circular 36/2017 dated 28th August, 2017-reg. Procedure for dealing with "Shipping Bill Copies" consequent to doing away with "Exchange Control Copy"and "Export Promotion copy"vide Board's Circular No.55/2016-Customs, dt.23.11.2016-reg..
Customs Brokers Written Examination to be held on 19.01.2018. Implementing Electronic Sealing for Containers by exporters under self-sealing procedure prescribed vide Circular no.26/2017-Customs, dated 01.07.2017-Reg..
Submission of GST Returns in place of Service Tax Returns. Guidelines on issuance of new Warehouse License, submission of the monthly statements of Warehoused goods, extension of validity of Warehouse License-Reg. Clarification Regarding Exports under claim for Drawback in the GST Scenarīo-Reg. Compliance of International Standards for Phytosanitary Measures(ISPM-15) in respect of wood packing material by exporters-reg.. Guidance Note for Importer and Exporter on GST roll out-Reg. Implementaion of GST in Customs-Changes in BE/SB Declaration-Reg. Customs-GST roll out and preparations thereof-Advisory on Customs related matters-Reg. Designation of Appellate Authority,Central Public Information Officer in the office of principal Commissioner of Customs, Visakhapatnam-Reg. Implementation of Hon'ble Supreme Court's Judgement Dated 27.10.2015 in C.A. No.554 of 2006 titled DGFT v/s Kanak Exports. Facility for online generation of raotation number by shipping lines/Agents-Reg. Declaration of valid GSTIN in Customs documents (BE/SB)-Reg. Rebate of State Levies(RoSL) on export of Garments and export of Made-up articles-Implementation by CBEC-Errors in the Bank Account Nos.,IFSC Code etc. Amendment to Chapter IX of the Customs Act,1962-Bond required to be filed under Section 59-reg..
Procedure for disbursement of money towards refund claims- Reg. G-Card Examination Notification Extension of submission of applicaiton date- Reg. 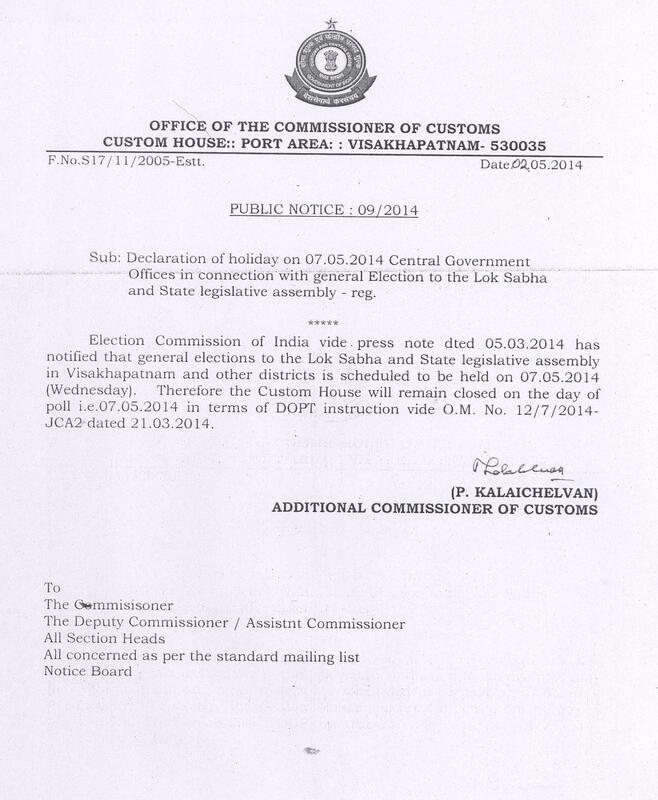 G-Card Examination Notification-2014 for CHA's- Reg. Designation of Appellated Authority, Central Public Information Officer in the Office of Commissioner of Customs, Visakhapatnam - Reg. Implementation of Module for Transhipment of Cargo from a Seaport to Another Seaport in ICES - Reg. Unauthorized certification of notified commodities(Minerals & Ores of Gr-I, G-II) by Inspection Agencies without recognition from Competent Authority- Reg. Implementation of Risk Management System(RMS) in Exports - Reg. Implementation of RMS for imports under the Exports Promotion Scheme such as VKGUY, FMS and FPS - Reg. Online Transmission of Duty Free Import Authorization issued between Customs and DGFT - Reg. Import of Hazardous waste under (Hazardous Waste Management , Handling, Transboundary) Rules, 2008 - Reg. Implementation of 'Self Assessment' in Customs - Reg. Online Transmission of Licenses/ Authorizations issue under Duty Exemption Scheme (DES), Export Promotion Capital Goods Scheme (EPCG) and online Transmission of DEPB licenses between customs and DGFT. Automatic Renewal of Bank Guarantee Clause - Reg. Extension of Warehousing period under Section 61 of Customs Act, 1962- Instructions - Reg. Guidelines for appointment of Public / Licensing of Private Bond Ware House under Section 57/58 of the Customs Act, 1962(Chapter IX) - Reg. Procedure for filing shipping bills under ICES Systems - reg.